Meet local historians, Mike Lawson and Keith Boughey at the Potted Meat Stick for a 3 miles (max) historical walk. Circular. Come and find out about early habitation of Baildon Moor. The photo shows Mike Lawson introducing walkers to a Bronze Age earthwork on Baildon Moor. Following the popularity of our Challenge Walk 19 miles to Skipton along the Dales Highway route) in 2018, Paul Robinson is arranging a new challenge for 2019. This will be to complete the 28.5 miles of “The Welcome Way in just 2 stages. Walkers are welcome to attend either or both walks and there will be a certificate for those who complete the Welcome Way in two days. Day 1 – Saturday 1st June. Start at 9am at the Potted Meat stick for a 16 mile walk to Ben Rhydding via Esholt, Guiseley, Otley, Askwith and Denton. There will be a toilet / refreshment stop in Otley town centre and we will catch the train back from Ben Rhydding to Baildon. If all goes to plan we should be back in Baildon by 5pm. Day 2 – Saturday 6th July. Meet at the Potted Meat stick at 9.30am (or Baildon train station at 9.50am) to catch the 09.56 train to Ben Rhydding (arrives at 10.11am). We will then follow the Welcome Way for the 12.5 mile stretch to Baildon via Burley in Wharfedale, Hawksworth Moor and Shipley Glen. There will be toilet facilities in Burley in Wharfedale and the Bracken Hall Countryside Centre, Shipley Glen, but a packed lunch is required. We should get back to Baildon village centre by 4pm where we can retire to a local hostelry for a drink and the awarding of certificates. People need to be aware that this is a challenging walk over rough and steep terrain so appropriate clothing and footwear is essential, plus water and a packed lunch is required on both stages. We are sorry but we cannot accept dogs other than assistance dogs on our guided walks. Join us for this “launch” walk for a new route, devised by Pat Addinell, a member of Baildon Walkers are Welcome. This fairly challenging route covers 13 miles and visits our local “three peaks” of Baildon Moor Trig Point, top of Northcliffe Park, and as near as we can get to the telecomms mast at Wrose. Elevenses Refreshment stop at Higher Ground cafe at Hirst Wood. Bring a packed lunch and plenty of water to drink. 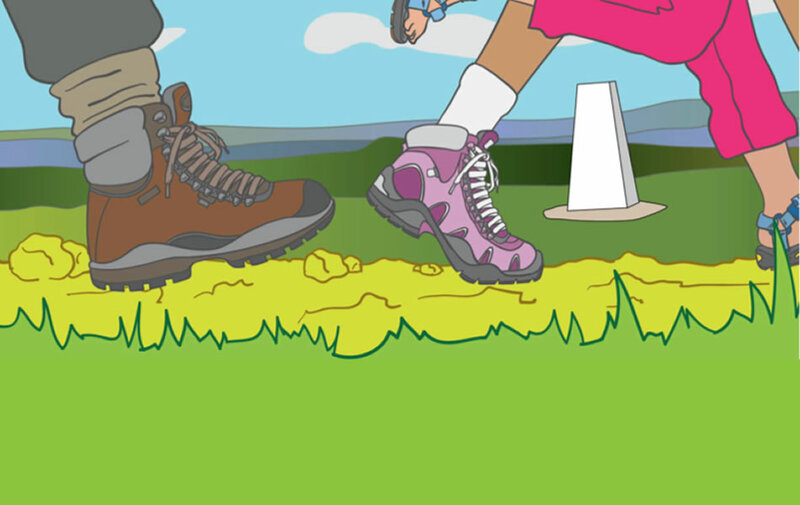 Much of the walk is on good paths, but there are some rough sections, so walking boots are advised. Meet Mike Lawson at the Potted Meat Stick on Midsummer evening at 7.00p.m. Mike will guide you on a historical walking tour of the Lost Hamlets of Baildon. We are sorry but we cannot accept dogs on our guided walks, other than assitance dogs. Details of this guided walk will be posted in the near future. Please book the date. Bring your own compass if possible. Meet Eddie Nash at 7.00p.m. at the Potted Meat Stick on a summer evening with a full moon. Details of the route will be posted soon. We are sorry but we cannot accept dogs on our guided walks, other than assistance dogs. Celebrate the 50th anniversary year of The Dales Way by joining this Baildon WaW Second Saturday guided walk from Shipley to Ilkley, following the Dales Way Link. 8 miles with one or two significant ups and downs. Bring a picnic lunch and plenty to drink. Sorry – but we cannot accept dogs on our guided walks, other than assistance dogs. Please come dressed appropriately for the weather and we recommend walking boots. Our walks leaders are not first aid trained but carry a mobile phone and would summon medical assistnace if needed. Please bring any medication and plasters that you might need with you.